Brenton Tarrant, the 28-year-old Australian, the self-confessed accused of killing 50 people in recent attacked at two Christchurch mosques, New Zealand in March this year has been charged ahead of a court appearance on Friday with 50 counts of murder and 39 counts of attempted murder. Brenton Tarrant to appear in court. Tarrant could be possibly considered as the first person to be sentenced to life in prison in New Zealand if found guilty on the additional charges laid on him by the police on Thursday. The 28-year-old, who will be representing himself, will appear in the High Court at Christchurch on Friday morning by video from a prison in Auckland, will have the opportunity to enter a plea. Otherwise, the short procedural hearing will be used to set dates for his future court appearances, including a possible trial date. 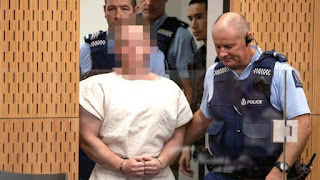 The jumbled manifesto Tarrant published online before the killings and the live-streaming of the attack on Facebook have both been banned by New Zealand's Chief Censor, the government officer in charge of censorship in the country. The law change which enjoys broad support in the parliament would ban most types of semi-automatic weapons, including those used in the March attacks. Prime Minister Jacinda Ardern, is also settling on the terms of reference for a major, independent inquiry to be held into the attacks in which the inquiry will scrutinise New Zealand's security agencies, the police as well as social media networks. Laws pertaining to hate speech are also being examined.